Cloud 9 Living respects your privacy. Cloud 9 Living intends to use and retain the personal information about yourself that you provide to Cloud 9 Living on the Website to process your purchases and/or redemptions of Experiences, Gift Certificates, and Experience Vouchers; to customize your personal shopping experience, and to send you other information about Cloud 9 Living including but not limited to marketing and/or promotional materials, and will not be used for any other purpose, unless Cloud 9 Living explicitly states otherwise at the time such personal information is obtained. In no event will Cloud 9 Living collect any information that can be used to determine your address, other than any billing address information associated with a credit card purchase. Cloud 9 Living will not sell or knowingly disclose your personal information to any third party; provided, however, Cloud 9 Living may compile or derive statistical information from your personal information to be aggregated with the statistical information compiled or derived from other visitors to the Website. However, such statistical information cannot be traced to you. Cloud 9 Living uses aggregated statistical information to better serve our guests and visitors to this Website and improve the manner in which the business of Cloud 9 Living is conducted. However, in connection with the regulatory requirements applicable to Cloud 9 Living, Cloud 9 Living cannot promise that all of your personal information will never be disclosed. For example, Cloud 9 Living may be compelled or determine it is necessary or appropriate to disclose your personal information to the government or third parties in connection with law enforcement actions and legal disputes involving fraud, misappropriation of intellectual property, infringement of intellectual property rights or other conduct that may expose us to liability. In addition, although Cloud 9 Living has adopted industry standard practices to safeguard your personal information, there is no such thing as perfect security regarding information transmitted by way of the Internet. Unauthorized third parties may unlawfully intercept or access transmissions containing your personal information. Therefore, Cloud 9 Living does not promise, and you should not expect, that your personal information will always remain private. You will select a password and account designation upon completing the registration process for purchasing and/or redeeming Experiences, Gift Certificates, or Experience Vouchers. You shall be solely responsible for maintaining the confidentiality of the password and account designation, and you shall be responsible for all activities occurring on the Website pursuant to your password or account designation. You shall immediately notify Cloud 9 Living of any unauthorized use of your password or account designation or any other breach of security affecting this Website. 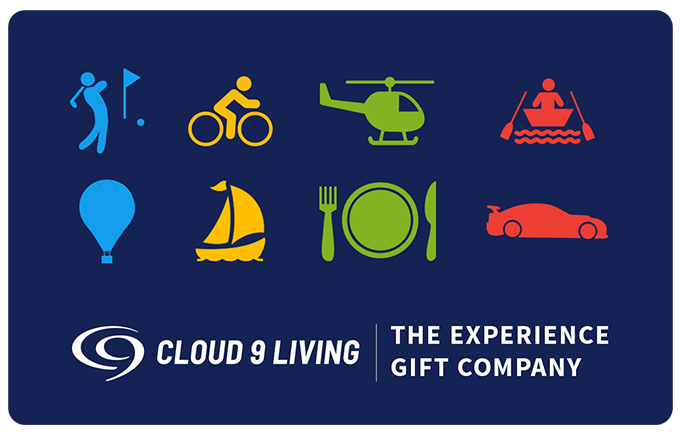 In the event you elect to receive marketing materials, including but not limited to email newsletters, from Cloud 9 Living you agree that we may use the data you provide to deliver marketing and promotional materials to you. You may revoke your consent to receive marketing materials at any time either by written notice to Cloud 9 Living Inc., 11101 West 120th Ave., Suite 150, Broomfield, CO 80021, or you may unsubscribe from any email newsletter via the link provided at the end of each marketing email communication. We transfer your data to our service providers only for data administration and hosting purposes. In connection with marketing efforts, we may utilize user data to create anonymous user profiles for purposes of market research, advertising or customized marketing materials. As part of certain marketing activities, our service providers may obtain necessary data to provide services outline herein. They reserve the right to use this information only for their designated activities and are prohibited from sharing it with unauthorized third parties. You acknowledge and agree that Cloud 9 Living is not responsible for and has no control over third parties that may be accessed or linked from the Website and you are encouraged to refer to the statements and policies adopted by such third parties related to the use and retention of personal information. The Website may use "cookies" on certain pages to optimize your experience. These "cookies" reside on the hard drive of your computer. These "cookies" transmit no information about you or your computer to us. You may be able to alter your internet browser to reject "cookies", although doing so may affect your ability to consummate certain transactions on this Website.